There are two invited talks at the end of the first day of the European Conference on Information Literacy 2015 in Tallinn, Estonia. The first invited speaker talk is Gobinda Chowdhury: From Information Literacy to Environmental Literacy: Design and Delivery of Sustainable Information Services. He started by mapping out three elements 1) Information skills and Information behaviour; 2) Information systems and 3) Information services. In the centre he saw sustainable information services. He identified economic, social and environmental aspects to sustanability. Social sustainability, for example, includes ensuring equitable access to information. Ideally, a service would be sustainable in all three ways. Chowdhury gaves some examples from Higher Education, highlighting that issues such as energy and green transport tend to be prominent. He noted that in the UK there are figures which show that the HE sector is important within the national economy. There have been about 400 signatories to the Talloires Declaration, "a ten-point action plan for incorporating sustainability and environmental literacy in teaching, research, operations and outreach at colleges and universities". So, what can the information community contribute? Chowdhury emphasised that plans for sustanaibility of information systems and services need to take account of the institutional context. One possibility is replacing print with digital, however ther ehas not been good research that actually demonstrates that replacing print with digital is necessarily more sustainable. He noted that "Globally the ICT industry produces over 830m tonnes of Co2", and specifically HE institutions produce high levels of CO2 from ICT. A substantial amount comes from individual use of PCs again, so reducing access time would seem positive. The speaker felt that sustainability could be improved through collaboration and access (e.g. open access). However, there can be questions about the sustainability of institutional repositories, which tend to be funded in addition to journal subscriptions etc. and have rising energy costs. He went on to talk about improving search recommendations and filtering, which would save time of learners' searching (and thus save energy costs) - though possibly this would not develop their information literacy! Chowdhury was keen to develop a community researching these issues. 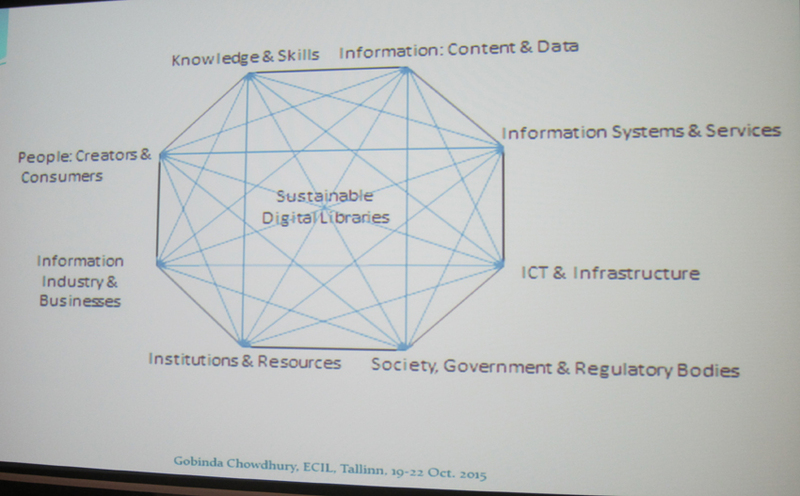 During his talk he also presented a model of the sustainable digital library (see picture).